Whether your dog is having behavioral issues or you’d just like to teach some basic manners, it’s time to call Fit ‘N’ Furry for professional dog training! Our positive and proven dog training approach can provide you total peace of mind when your dog’s unwanted behaviors are replaced with good manners and communication. We have a variety of dog training programs and options, including one-on-one training and boot camps. 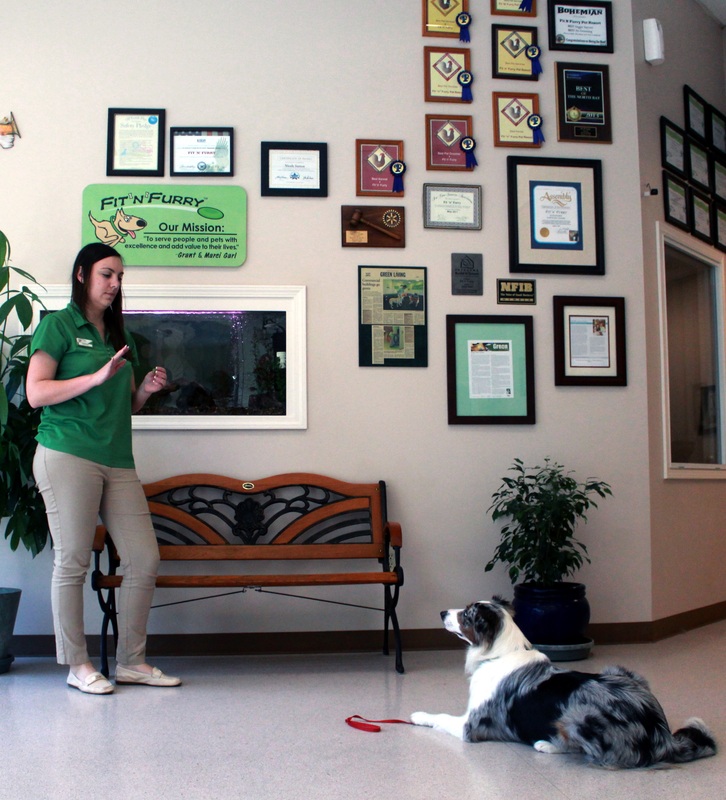 Our staff has extensive training and certification, including IACP-CDT (Certified Dog Trainer through the International Association of Canine Professionals). Our programs offer everything from a solid foundation in basic obedience such as sit, down, and walking calmly on leash, to potty training, to advanced off-leash skills and more challenging behaviors. We also provide private training and advanced training classes. All classes are at our modern facility in Petaluma, CA and convenient to all of Sonoma and Marin counties. Schedule your FREE Dog Training Evaluation today! Basic dog training begins with positive and proven fundamentals. You will have a dog that walks calmly on leash, is discouraged from jumping, and sits, lays down, and stays on command. By establishing better communication skills and house manners, you will begin to enjoy a positive relationship with your dog that lasts a lifetime. Intermediate dog training adds consistency with your dog's basic manners? This call introduce to more advanced off-leash skills. Our Intermediate dog training course focuses not only on your dog’s basic on-leash commands, but also starts the process of giving you better off-leash control. We're convenient to all of Marin and Sonoma counties. Your relationship with Fit 'n' Furry doesn't end with your class. We offer our dog training graduates lots of perks - and believe your training class is the beginning of a great relationship with both your dog and with us. 100% improvement considering Zeus needed help in so many ways. On your dog training exit survey, I wish you had a higher rating than Excellent, your staff was fantastic! Zeus is so much better behaved. Prior to training, he was on the next train out of town. Connie is so much better at listening to me now. I was more than happy with my experience with Fit N Furry. Your trainers are very skilled and professional. They were always happy to see my Connie. Now Connie listens to me and sits at all crosswalks! It began back in 2005 when my wife Marci and I were talking with our daughter, Mandi, in the kitchen one night dreaming of a full service pet care facility for our furry friends! The primary vision was that it be an environmentally sound project that gave back to the community. Copyright © 2019 Fit N Furry Pet Resort & Training Center.